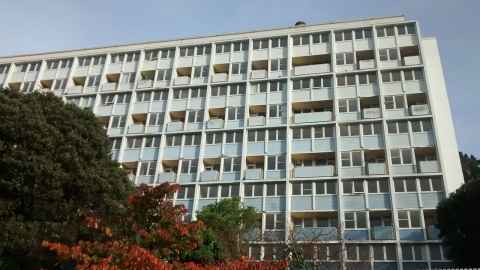 Modern heritage saved from demolition, the controversial Gordon Wilson Flats in Wellington. Photo by Ballofstring, distributed under a CC BY-SA 3.0 licence. Saving architectural heritage in New Zealand is a real struggle, but even more so when it is modern. Seismic issues, fitness for purpose and the cost of building code upgrades, such as lifts and fire protection, make it difficult and expensive to preserve many of our older historic buildings. However, there is often public acceptance of their value and character. But with more recent buildings, particularly those from the late 20th Century, there is another task – getting agreement from owners, the public and authorities that they are worth keeping in the first place. He made this point at a recent talk in Wellington’s late 1950s Futuna Chapel, itself an example of a modernist building saved from demolition, now cared for by a trust and used as a community facility. People often don’t consider more recent buildings as candidates for protection, preservation or adaptive reuse. There is an incorrect assumption that buildings need to be of a certain age before they can be listed by Heritage NZ (formerly the Historic Places Trust) or local councils. But recent buildings can be historic or of such merit that they deserve to be kept. In both Auckland and Wellington there are currently fights to save towering inner city modernist apartment blocks, dating from the First Labour Government’s famous era of state house construction. In a controversial decision, the Environment Court rejected a request by the owners of the Gordon Wilson Flats to delist the building and thus it was saved from demolition – for now. But the public do wonder why some of us architectural enthusiasts are trying to save big buildings like these that have been called “eyesores”. Architecture literally gives a place its character. No one would argue that the appearance, for better or worse, of our towns, villages and cities isn’t bestowed by the built environment and thus it’s a matter for public concern as much as individual building owners. But when it comes to modernist architecture, the public is often baffled as to why “experts” think something is good. In my mind, two things are going on in relation to the buildings that make up our city environments. Most citizens are either too familiar with the buildings in our towns and don’t recognise how remarkable they are. Or, conversely (and a bit like modern art), people are unfamiliar with them in terms of style and the aims of the designers, and don’t understand what it is that makes them special. I went to high school in Hawke’s Bay in the 1970s at a time when no one realised the value of the Art Deco and Spanish Mission buildings. The people of Napier and Hastings were happily knocking them over. But look at Napier now – it has really made something out of that heritage and is a leading tourist town in New Zealand. I would say to Masterton – look at your buildings in a new light, and make the most of them because one day they could become an important attraction and drawcard to your town making it a modernist Mecca. Tourism is now the country’s number one earner and every city or settlement, large or small, has the potential to make something out of its buildings. Modernism and Minimalism, in architecture, furnishings and household design have enjoyed something of a worldwide Retro Modern revival in the last 15 years. With this in mind, I have a suggestion for Masterton – that Wairarapa town that cannot compete with the quaintness of its neighbours, Martinborough and Greytown. What many people don’t realise is that Masterton had a big earthquake in 1942 and is now a prime example of modernist rebuilding. I would say to Masterton – look at your buildings in a new light, and make the most of them because one day they could become an important attraction and drawcard to your town making it a modernist Mecca. Modernism was mainly a post-war phenomenon in New Zealand. Many of our town centres have big institutional buildings from the late 1950s and 1960s in a modernist offshoot known as Brutalism. It is often assumed this name derives from the rather brutal appearance of some of these. But the word actually comes from the French phrase béton brut, which means raw concrete. The ethic of the designers was one of simplicity and the honest, truthful expression of materials, developing out of a period that was also one of post-war austerity. The negative appreciation of these buildings by many citizens is, I think, due to unfamiliarity with the intentions behind the style – and it is an acquired taste. A parallel is with other aspects of modern art. A hundred years ago the work of the Impressionists, such as van Gogh, Gauguin, Monet and others, baffled both the public and the establishment alike. Since then their work has gone from being greeted with hostility to being widely loved. It’s the same with much popular music and literature of the modern era, and even food and fashion. What was strange or weird when first encountered on the catwalk or dining table becomes widely accepted a few years later. The late Robert Hughes – art critic, writer and documentary maker – talked about modernism’s “shock of the new” which explains why thoughts of ugliness, unpalatability and uselessness are often our responses to what is unfamiliar or not understood. In terms of architecture, the late Sir Ian Athfield and Roger Walker in early 1970s Wellington were misunderstood and derided as a couple of hippies with their houses referred to as “Noddy houses”. But they are greatly admired now. So I would say to Whakatane, for instance, which has a Roger Walker airport building – look after it, because that too could become a tourist attraction. History isn’t always pretty and neither is some of our architectural heritage. Ben Schrader in his recent talk made a third and very valid point about our architecture – it is not just about appearance and architectural merit. He suggests that sometimes we need to focus on the social and cultural significance of buildings. You may not get why the Gordon Wilson Flats in Wellington are innovative and important in terms of appearance and structural innovations. But you must appreciate how significant they were socially in the lives of New Zealanders and as part of the Labour Government’s roll-out of housing to address the crisis of those days. Many of these inner-city apartment buildings were among the country’s first welfare housing and the Gordon Wilson Flats is a perfect example. All the bedsit units in the 87-unit complex were allocated to single working women in their 40s and 50s who had previously never been able to afford their own place and had been living in rooming houses. So it’s not just about architectural merit, appearance or aesthetic, or whether you like Brutalism or not. It is historic importance, social significance, and the meaning of the building to people who lived, worked or went to school in these places. Or even sometimes how they were imprisoned or badly treated in them! But we can have win-win outcomes in this time of housing crisis. Yet another block of flats from the 1950s was emptied out by Housing New Zealand and declared unsuitable for its clients. That building in Symonds Street was acquired by the University of Auckland and has been restored and turned into student housing. That’s a good outcome for both architectural heritage and a section of the population who are also feeling the pinch of the housing crisis. There is no reason why Victoria University of Wellington, current owners of the Gordon Wilson Flats, can’t do the same rather than carry on in their aim to bowl the building to improve campus access. Raising and broadening public awareness of what makes a building important is crucial if we are to save New Zealand’s modernist heritage. If you already care about your built environment and local history, you can help by getting significant buildings on council district plan lists. You can also follow the work of DOCOMOMO New Zealand, which is part of a global organisation of architectural experts working to preserve their country’s modernist architectural history. Bill McKay is from the School of Architecture and Planning, Faculty of Creative Arts and Industries. This article reflects the opinion of the author and not the views of the University of Auckland. Used with permission from Newsroom, Must heritage be handsome? published on 14 January 2019.